Icecream PDF Split&Merge is a versatile application that makes the process of splitting and merging PDF files easy and intuitively comprehensive. Use this program whenever you want to split a large document into smaller files or merge 2 or more PDF files into one.Icecream PDF Split&Merge stands out from the crowd thanks to user friendly interface and perfect logic behind the processes which makes the program suitable for all categories of users. At the same time, it features a number of advanced options and appears to be pretty powerful to complete different types of tasks. Thus, the program allows you to split PDF documents page by page, by groups of pages or page ranges, or save documents without splitting them but with unnecessary pages removed.Application works with password protected files. In fact, it’s impossible to view their content without specifying a password, but after entering a valid password you can work with such files in a regular way.The program is fairly easy to use–you can drag and drop files into program’s interface, choose the modes, arrange files in a desired order if you want to merge them or choose a necessary split option to split them, and let the program complete the process in a few seconds. 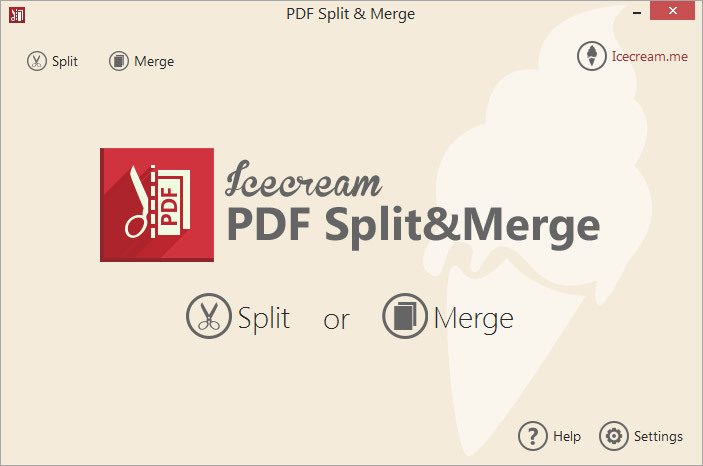 Icecream PDF Split&Merge is free of charge, easy to install and doesn’t require registration.